Putting together your ideal beauty regimen of skincare products can feel overwhelming. That’s why at Paula’s Choice Skincare we take a different approach to building the perfect skincare routine. With good skincare, it should be easy to find the right products for your skin type and skin concerns! One of our core Paula’s Choice Skincare philosophies is that skin type is not one size fits all. That’s why we have products for just about every skin type and to address just about every skin concern under the sun. We go a step further than the norm by putting together cohesive routines to address those needs, whether you have extra-sensitive skin, skin that needs help with anti-aging, or any skin type in between. We take the guesswork out of the process so you don’t have to try to piecemeal your skincare system together. You can choose a routine that meets the core needs of your skin type and concerns, and then fine-tune it as needed. Another helpful aspect of our skincare kits is that they offer a moisturizer with SPF for the day, as well as a non-SPF moisturizer for your nighttime skincare routine. Many brands offer only one or the other, which shortchanges your skin of the benefits each provides. Better skin at any age begins with daily use of a broad-spectrum sunscreen! Anyone who has struggled with acne knows that you just want affordable skincare products that work, which is why we use nothing but gold-standard, research-backed ingredients for our CLEAR skin regimen. We also take into account that there are different severity levels of acne, so we offer an acne routine for mild to moderate breakouts as well as an extra strength routine for stubborn acne. We know that not everyone is on the same playing field when it comes to how many skincare steps they want or need. Our Essential Routines are simplified to address skin’s core needs (the minimum to keep it healthy, smooth, and protected), whereas our Advanced Routines include a broader mix of products to target more complex needs. 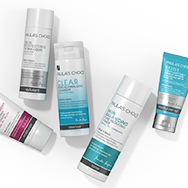 All Paula’s Choice leave-on skincare products—especially our serums, boosters, and targeted solutions—use what we call the cocktail approach to skincare. Skin’s needs are more complex than what any single ingredient (however great) can satisfy; therefore, we blend antioxidants, replenishing, and skin-restoring ingredients in amounts that research shows can remarkably improve skin. Whether you go with an advanced routine or keep it simple with just the essentials, we’re here to help you navigate the steps. Here’s our complete guide on how to put together a skincare routine.